Normally, the way Apple handles reviews of its new phones is by placing them in the hands of a select few prestige organizations and then setting a date when everyone can publish their review. It’s pretty effective! You get a wave of coverage about the newest iPhone, all at the same time, taking over a news cycle or two. But for the iPhone X, everything is different. Wired’s Steven Levy got his hands on one, and Axios’ Mike Allen got a loaner from Apple that he promptly gave to his teenage nephew to play with. But the main source of hands-on iPhone reviews so far? YouTubers. There’s even a first look from Turkey, though it’s less clear if this is an officially sanctioned preview from Apple or more like a “someone got their hands on an iPhone X early” situation (any Turkish speakers out there — feel let me know in comments or email me). Update, 11/2/2017: Helpful reader Arda K. emails a bit more context about the following video: “Let me explain what’s going on in the Turkish video. These guys are managing one of the biggest tech websites in Turkey and they also produce vlogs on YouTube. St. Louis–based YouTuber Mark Watson, who’s run his Soldier Knows Best YouTube channel professionally for seven years, says he just got an email from Apple in mid-October asking where he’d like to come out to see the iPhone X last week. He hopped on a plane to New York City (on his dime — Apple didn’t pay) and shot video while getting some time to handle the phone. 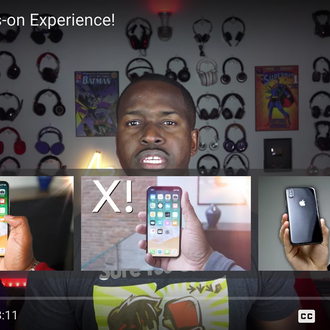 The YouTubers did seem to be using slightly limited versions of the iPhone X — none could watch video on the phone or test out the rear dual cameras, for instance (though they were able to test Apple’s front-facing Portrait mode, which looks slick), but all were able to use the facial-recognition tech. It’s also unclear how much time they got — generally a reviewer for a major outlet will get anywhere from a couple of weeks to at least 48 hours using a phone before being asked to render a verdict, though that standard can vary wildly. It’s an interesting and, frankly, smart strategy by Apple to place their newest phones in the hands of YouTubers with big, dedicated following. YouTubers, even more than print outlets, are highly dependent on clicks and subscribers — and thus even more beholden to access from big tech companies like Apple. Of course, it wasn’t just YouTubers who got invited to Apple’s Tribeca loft to look at the iPhone X. Popular Science, which did its own hands-on video, is nearly 150 years old — though one could argue legacy print operations have a shakier business model than many YouTube channels at this point. Still, it makes sense. If you’re Apple, would you rather have have potential buyers first see reviews in an outlet like the Verge, the New York Times, or the Wall Street Journal, which will inevitably nitpick some aspect of the iPhone X, or gather a group YouTubers who make a living being affable and charming on-camera talk about a product they’re preinclined to like?